On LinkedIn, there is a pattern/widget that is used in several places. 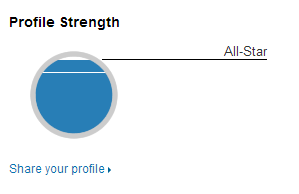 Most notably, it is on the right hand side of your LinkedIn profile, which shows how complete your profile is. When you hover on it, the meter moves up and shows you what the next level is. 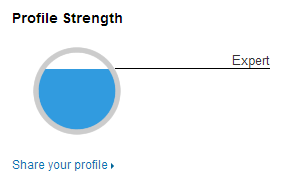 LinkedIn has a help page which describes what this meter is about. Does anyone know if there is a proper name for this pattern? It seems like an extension of the completeness meter design pattern here, except it lets you know what the next level is called and what "percentage" it is. Any opinions or tips on the pros and cons of this pattern would be welcome too. You're right that it is similar to the completeness meter pattern. It has some elements of the progress bar there as well. You could argue the progress bar relates to something required (i.e. you have to complete 5 pages of a survey, you have to wait for the download to complete), while the completeness meter relates to something extra (i.e. LinkedIn encourages you to fill out more sections). See answers to the question "What is the name for the technique used on Yammer, LinkedIn etc profile pages?" for more details. The overall goal of this and similar patters is to incentivize engagement. It's adaptable in the sense that both end-goals and number of task to complete the goal can be customized. Easy for users to understand. It's effective to get users to reach the goals in a short time. The lack of continuous engagement, when goal is completed there is no further incentive. It's hard to modify or edit once the goals and tasks/expectations are defined therefore it’s not flexible. What is the UI pattern used for managing people in Google+ called?